The early 1970s were a crucial period in the political and intellectual climate of France. The newspaper Libération was founded in the wake of the protest movements of 1968, and the country was gripped by industrial, political and civil unrest on a huge scale. Behind all this were deep debates about the nature and justification of revolt, class conflict and consciousness, and the nature of what it meant to be free. It is Right to Rebel, available in English for the first time with a new Preface by Philippe Gavi, is a fascinating discussion between three thinkers about this extraordinary period. The book comprises extensive conversations between the philosopher and writer Jean-Paul Sartre, journalist and co-founder of Libération Philippe Gavi, and political radical and Maoist Pierre Victor, all conducted between 1972 and 1974. In these conversations Sartre works out his relation between socialism and freedom, providing fascinating background to his tortured relationship with the French Communist Party. Together with his interlocutors they explore and debate what should be the basis of ethics, the nature of oppression and racism, including immigration, the Arab-Israeli conflict, the Chilean military coup in 1973 and more. A recurring theme is their exploration of two major questions: what should ethics be based on, and what makes for a revolutionary? 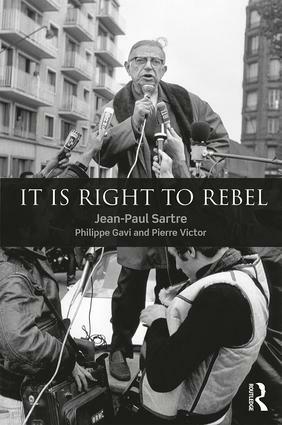 It is Right to Rebel is a fascinating insight into the philosophical and political background to Sartre's thought as well as the two lesser-known figures of Gavi and Victor, who play political foil to Sartre's measured philosophical stance. It is a fascinating, rich new resource for anyone studying Sartre, political theory, and French politics and political history. 10. "It Is Right to Rebel"
11. What Makes a Petty Bourgeois or a Worker Rebel? 13. "Equal Pay for Equal Work"
20. "What Would You Have Decided?" Conclusion: A Triangular Relation of Forces. Jean-Paul Sartre (1905-80). The foremost French thinker and writer of the early post-war years. His books have exerted enormous influence in philosophy, literature, art and politics. Philippe Gavi is a French journalist specialising in media issues. With Sartre, he was a founder of the French newspaper Libération. Pierre Victor (1945–2003). Born Benny Lévy, Victor became a prominent figure on the Maoist left during the May 1968 civil unrest in France, and was Sartre’s personal secretary from 1974 to 1980. After embracing Orthodox Judaism, he emigrated to Israel in 1997 where he helped establish the Institut d'études lévinassiennes.